Amazon Web Services re:Invent Conference in Las Vegas | Press Center | 4Wall Entertainment, Inc.
PLSN's Nook Schoenfeld recently covered the Amazon Web Services re:Invent Conference held in Las Vegas last November. 4Wall Entertainment played a key role as lighting provider for the event. Check out the full story reprinted from PLSN below. 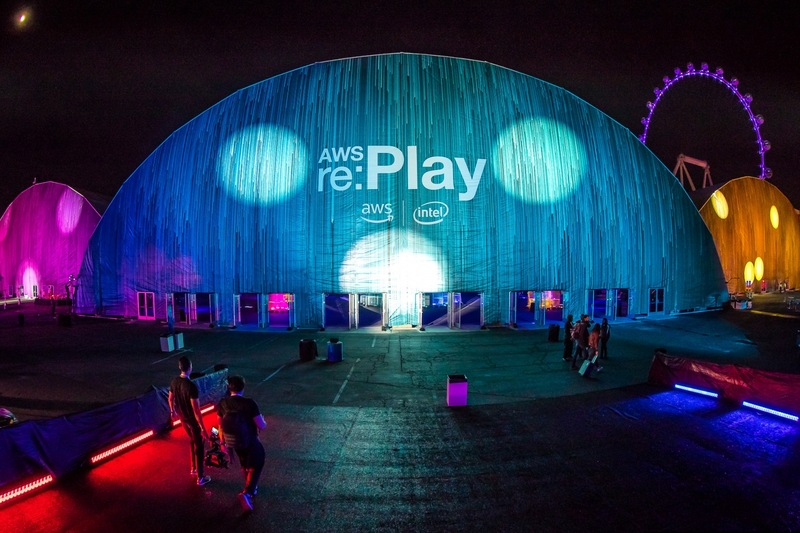 Amazon Web Services (AWS) held their annual re:Invent Conference in Las Vegas the last week of November with events and meetings taking place at multiple hotels including MGM, Aria, Venetian/Palazzo, and more. The conference is the epicenter of the cloud computing universe and is open to developers, clients, partners, and executives from a wide array of companies ranging from Netflix to MLB to Intel. 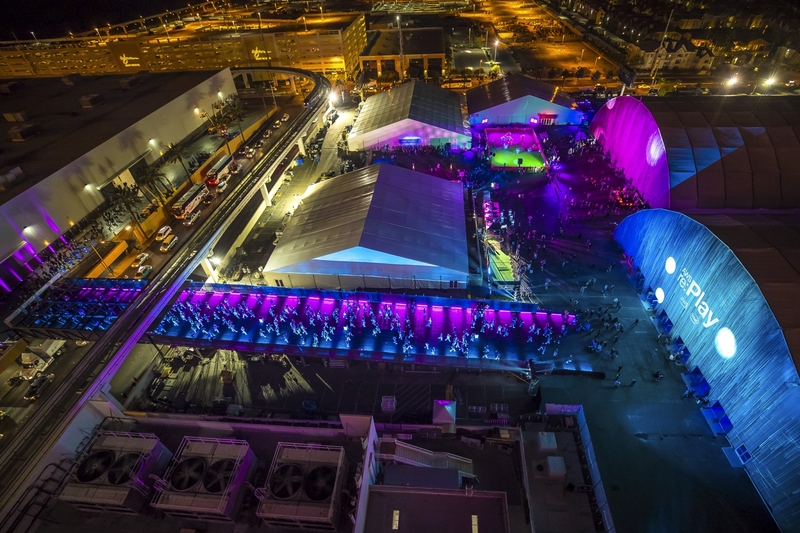 On November 30, the conference culminated with a massive party, titled re:Play, that takes place on an enormous site more akin to a festival grounds than a pop-up party. 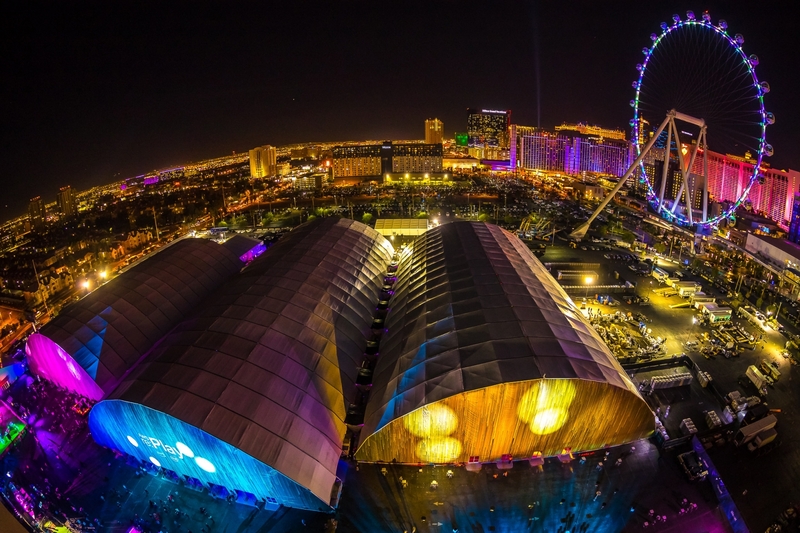 The event was housed in three Megastructures for over 25,000 guests and took place at the High Roller Parking Lot adjacent to the Sands Expo Center. Los Angeles-based creative studio Production Club was called on for the fourth consecutive year to design and produce the re:Play event. Production Club is an extensive multidisciplinary team founded by four partners. Corey Johnson, the CEO, oversees the business, ideas, and direction. COO/CFO Vivek Srinivasan runs day-to-day operations and executive-produces their large events. Kyle McCarthy is the CBDO and Miguel Risueño (a.k.a. Mike808) is the creative director, overseeing all design, artistic and creative processes. While all three contribute greatly to this overall project, Johnson gives a lot of credit to Miguel for the overarching production design itself, across its wide range of features spanning from scenic elements to technology-based activations and of course the main-stage design. Vivek adds to the conversation. "We spent close to a year planning this event. To give you some perspective of how this show has evolved, when we first started in 2014, there were 6,000 attendees. 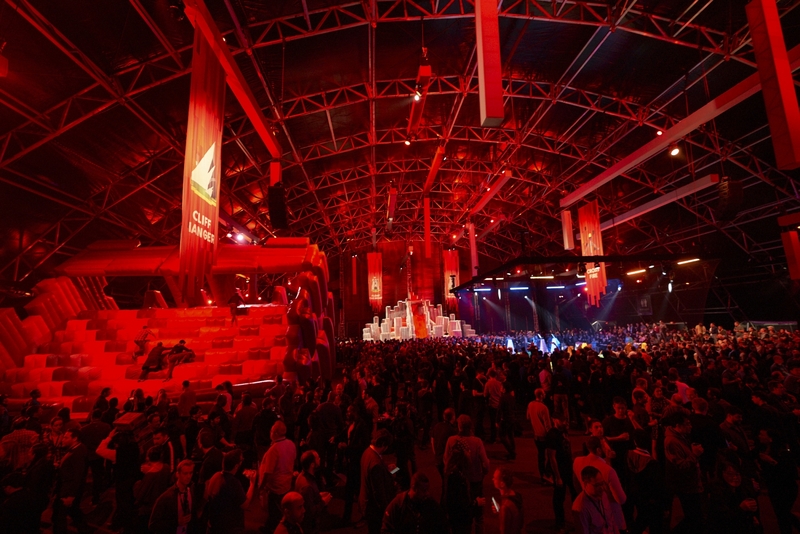 The event has grown over four times that size now, with an estimated 25,000 people attending the closing party. We design and curate all of the elements, book the talent and deal with the permits and overall infrastructure of the build and operation." As Corey says, "it takes a full year, because we are handling concept to execution in close partnership with AWS." Each of the party's three Megastructures were named and themed. The "Red" structure consisted of large-scale inflatables and physical activities, the "Green" structure housed the stage/club environment, and the "Blue" structure was technology-based and digital in nature. All the structures were separate but interconnected via tented walkways to allow for a seamless experience for attendees. The massive half-moon shaped roofed structures were all made from truss and materials provided by AG Light and Sound (which also provided the LED video product). The center structure was the largest one, at 420 by 200 feet (LxW). 4Wall provided the lighting system for the overall event. "We have a great working relationship with 4Wall, particularly Todd Roberts, who worked closely with us to bring the lighting to reality," states Johnson. "Todd serves as director of live events, but with this particular project, he took it all under his wing and worked closely with our team. This show is part concert, part theme park and part arcade, so you can imagine all the lighting we needed to pull off this show. 4Wall was our choice for executing such a high-profile show, and we appreciated the personal touch that Todd gave us." 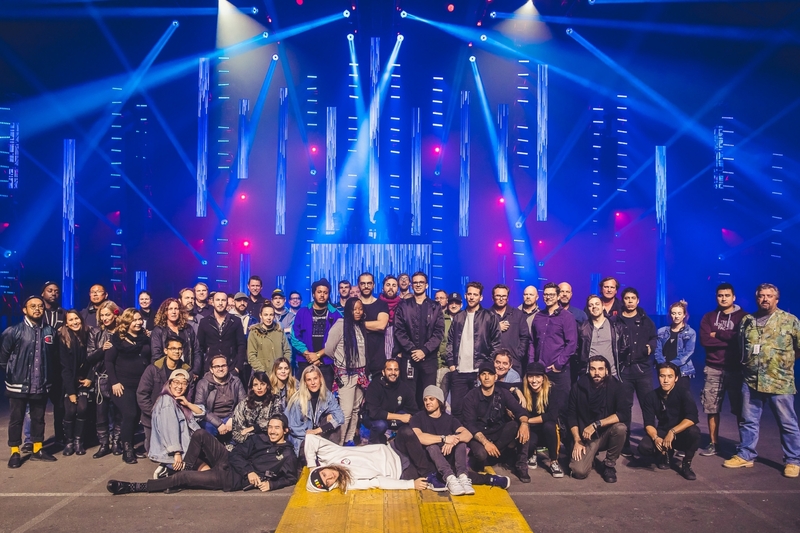 Roberts worked closely with Production Club technical producer Scott Bokowski and lighting designer Cory FitzGerald to bring the project lighting to reality. Special effects experts Pyrotecnico were also brought in to add lasers, cryo effects and more to the party. Todd Roberts was pleased with the overall outcome and chats about their involvement. "I started working with Production Club about six months prior to the event, but the last two months were pretty hot and heavy. We sent four techs in to wire all the trusses and system for a week before we brought in another 14 techs to hang it all the second week. "We hung 4,000 fixtures all in all and kept most of the gear list they spec'd intact, due to the fact that we pulled in gear from our LA, Orange County, Vegas, and Nashville operations. I believe we found the only 42 VL 6000 Beams in America that weren't on tour," he laughs. "We loaded in 14 trucks with just fixtures and cable and were up at trim ahead of schedule. Each day we would have to swap maybe five fixtures that had faults. Pretty amazing ratio. I'd also like to point out that we filled 66 universes with DMX on stage and another 48 in the house. It was all tied together on one fiber network." In the Green structure, Risueño's custom stage design made use of production elements and automation that spanned the entire length of the room. The design included vertical trusses over the stage that moved into various configurations and held a plethora of ACL 360 BAR's among other fixtures and video panels. The vertical trusses acted like a physical interpretation of data flow, which was the overall conference graphic identity, also designed by Production Club. Hung above the crowd were long lengths of LED tiles lined with rows of Clay Paky Mythos IIs that rained beams down upon the revelers. 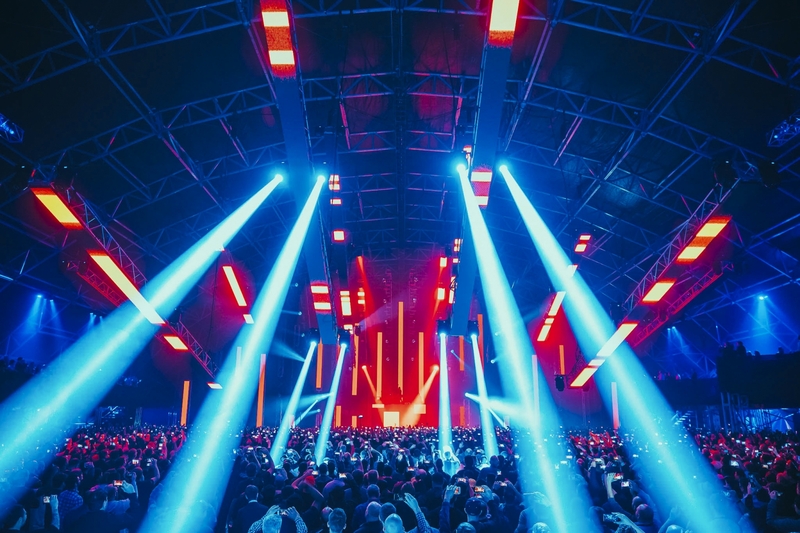 Vivek adds, "We wanted all the visuals that started on stage to extend completely over the crowd and had Cyberhoists moving the trusses into various shapes, immersing everyone in the experience." Video director Max Nicklas and lighting programmer Brian Jenkins worked with Risueño on the overall looks for the show in this structure. Then, in the Red structure, a warm color palette immersed participatory activities going on in the Dodgeball Arena and custom-designed and fabricated ball pit area and bounce castle for adults that included a two-story center slide and had 239,417 balls in it. Johnson adds, "The idea there is to re-connect attendees with a youthful sense of play and to offer physical activities that take people back to their roots in a way that rarely happens in adulthood." Out in front of the structures there was a sports court where there was a 5v5 game of bubble soccer. Each player is encased in a large plastic bubble where they bounced into each other as they chased the ball. Think about it as bumper cars meets soccer, and you get the idea. 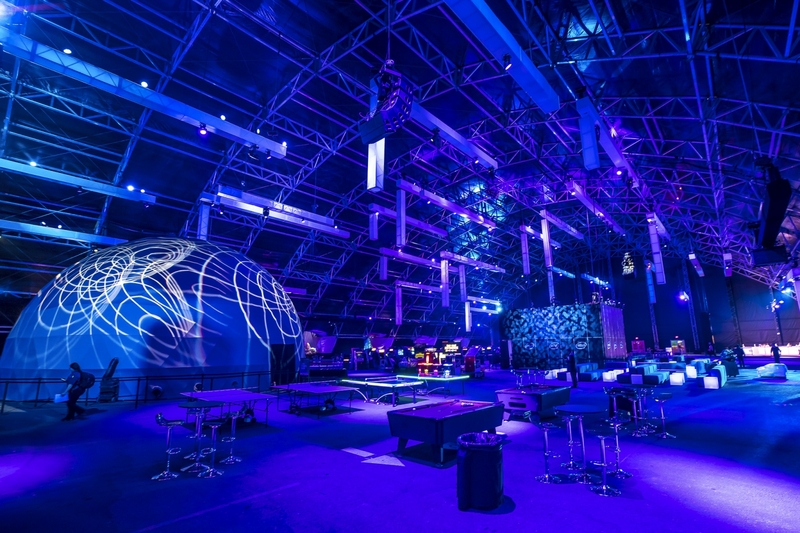 Finally, the Blue structure had a technology and digital focus where attendees could enjoy more immersive, interactive experiences. For example, in the Laser Dome, a 30 meter dome was set up on one side that featured a set of gaming chairs, where people could sit on the floor and watch a time-coded laser show projected on the interior surface of the dome while listening to music on wireless headphones, as if in a planetarium. 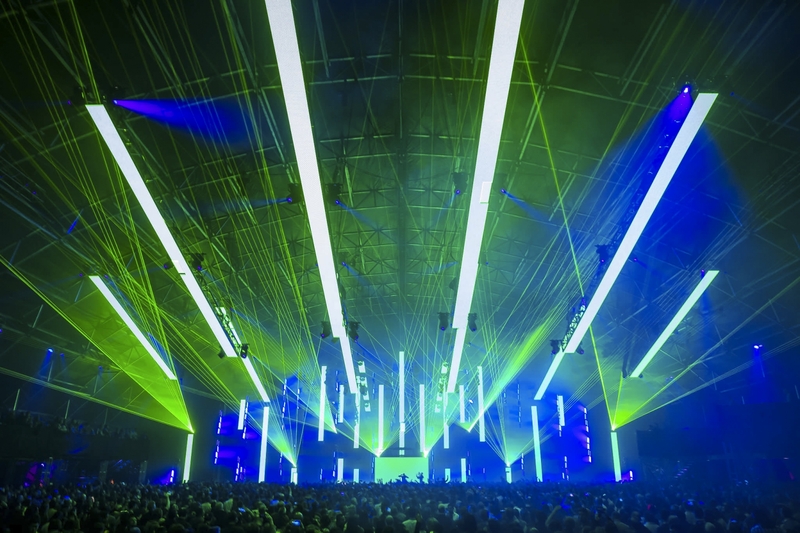 The three-minute show was designed by laser programmer Derek Abbot, with equipment from Pyrotecnico and was shown throughout the night as people lined up to await their turn to view. There were arcade games to play as well. And if this isn't enough Vivek adds, "we served full dinner and had an open bar for all 25,000 attendees." Another activation was what Corey referred to as a flagship design project. Production Club designs and develops an interactive activation for Intel each year. This year, the piece allowed the audience to explore generative lighting and video behaviors by using just their body movements inside a room of light. 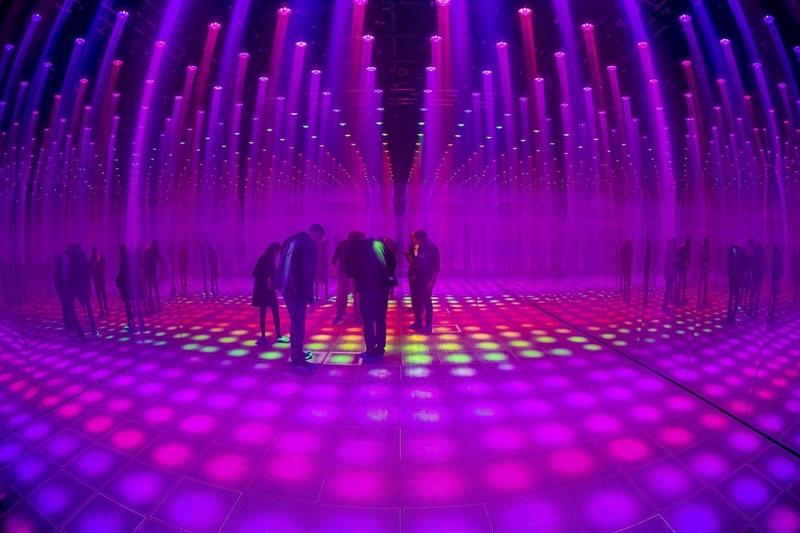 Attendees walked into an enclosed box consisting of a grid of 13×13 ACL 360i's in the roof, a corresponding grid of LED tiles on the floor and mirrored walls around the perimeter. As there is not an off-the-shelf solution to make a lighting system interactive, Production Club had to develop their own software in Unreal Engine 4, to connect the lighting, video and sensor systems through Art-Net. This custom software was also in charge of recognizing gestures, performing blob tracking and generating the lighting effects in real time. One of the over-arching challenges of the event was how to route the crowd from the Sands Expo Center to the Linq lot without having to take a 20-minute walk out to the Las Vegas strip and through various properties in order access the party. To solve this, Production Club worked with AG to build a temporary 100-foot bridge and ramp to connect the two sites directly. The bridge extended across the street, but went beneath the monorail that separated the two areas. Through the use a 90-ton crane and some clever engineering to piece the sections together, the team completed the project for the second year in a row, while admitting they needed to overcome some of the initial challenges from the original design and some skeptical officials along the way.